Depending upon who you talk to, elves can range in size from the dwarf-like workers of the North Pole, to the gigantic elves of Tolkien's Middle Earth. The standard I use to determine the height of an elf comes from Scandinavian and Germanic myth. In these myths, elves (or rather light elves) are as tall, if not taller than men. Dark elves, on the other hand are short and misshapen. The first group of miniatures are Eureka 18mm Elves of the Lofty Spire. 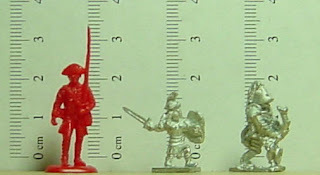 The Eureka 18mm fantasy line focuses primarily on LoTR-like miniatures, and they are quite tall compared to 15mm figures. Even so, they are still too short for my tastes. They would however, be perfect for AD&D style elves in 1/72. Pictured below is an Elf with sword (300HEL03), two Elf musicians (300HEL06), an Elf standard bearer (300HEL05), and two Elf sorcerors (300HEL07). Taller still, are the Eureka 18mm Wood Elves. Several of these figures could almost be used as 1/72 without any alteration. The first and third figures next to George are Wood Elf bards (300WEL06); the second and seventh figures are Wood Elf mages (300WEL07); the fifth figure is a Wood Elf standard bearer (300WEL05), and the fourth and sixth figures are Wood Elf archers (300WEL01). Finally, two last miniatures -- the Tin Soldier Elven Maiden Warrior (DFA59) and an Irregular Dark Elf Saxaphonist (FDE9). 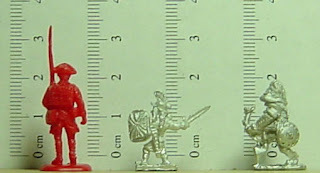 The Tin Soldier elf is true 15mm, and too small for my purposes. 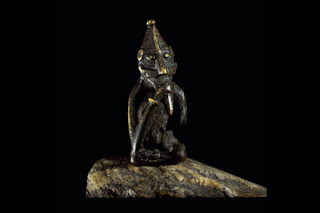 The Irregular figure is fairly typical for the line. It would work well as a dark elf without alteration, and is a rather unusual sculpt. A group photo of the various elves shows the differences in height. From left to right, they are Tin Soldier, Irregular, BRF, and Eureka. It's tough to find miniatures of tall elves. In myth, it seems elves, which originally represented natural forces, became smaller as human power over nature increased. As a preference, I like the elves of Luthiel's Song which include many varieties -- large, small, good and not very good at all. Luthiel's Song is impossible to find in the bookstores. I guess I'll have to order online.